An MH-65 Dolphin rescue helicopter crew from Coast Guard Air Station San Francisco rescues two boaters after their vessel was beset by high winds along the old Berkeley pier, west of the Berkeley, California. The Coast Guard rescued two boaters in the Berkeley Marina Saturday after their boat was beset by high winds against the old Berkeley pier. 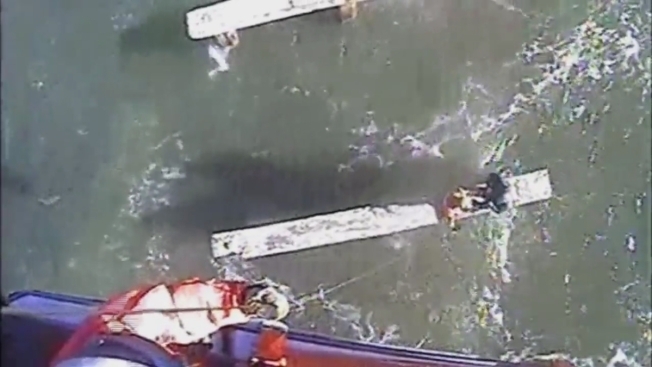 According to officials, at approximately 11 a.m. the Coast Guard Sector in San Francisco received reports of two mariners stranded on the Berkeley pier runs after their boat was pushed against the pilings by high winds. A helicopter crew arrived on the scene and was able to hoist the two boaters. The boaters were immediately transported to Air Station San Francisco and were reported to have no injuries. Officials are urging boaters to avoid operating boats during high wind conditions, only if necessary. The breezy conditions in the Bay Area have led to a red flag warning that will be in effect until 10 a.m. Sunday morning, according to the National Weather Service.